There are two things that make the vehicle work well for the customer. One of the factors that the Ram ProMaster stand out is the type of engine it has. Another factor is the drive mode that the vehicle has. The Ram ProMaster has been masterfully created with the purpose of providing people with a good performance. One of the features of the Ram ProMaster is the engine. 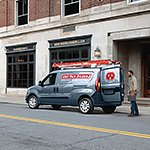 The Ram ProMaster features the 3.6L Pentastar V6 Engine which makes the ride smooth. It also gives the vehicle quite a bit of capacity when it comes to hauling large amounts. To go along with the engine is the valve timing which enhances the efficiency of the performance with its timing adjustment. The front-wheel drive is also a feature that makes a power effort towards the efficiency of the vehicle. A test drive is all you need to see that the Ram ProMaster is capable.